Another exciting season of college football is coming your way! And here at BetStars, our experts will give what you need to know, from the Heisman Trophy lines of star favorites Bryce Love and Tua Tagovailoa to the lines of who will hoist the championship trophy at Levi’s Stadium in January. 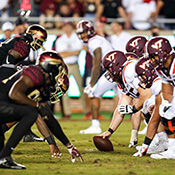 With odds on every FBS game alongside previews and tips, we’ll have everything you need to graduate top of your college football predicting class.